Diastema is comprised of around 20 small herbaceous plants distributed from southern Mexico southward into Bolivia. 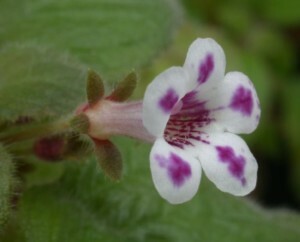 The genus has been characterized morphologically using 5 finger-like nectary lobes, purple-spots on the corolla lobes (aside from red-flowered species), and fruit dehiscence. Diastema appears to be an assemblage of more than one genus based on multiple lines of evidence and continuing research will resolve these relationships. Most of these species have significant ornamental potential, but most need plenty of extra humidity. Several intergeneric hybrids have been crossed and produce some interesting variation in flower color.